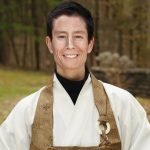 In this talk, given following our annual vigil to celebrate the Buddha’s enlightenment, Shugen Roshi evokes the Shakyamuni’s profound humanity and exceptional faith, emphasizing that we show our reverence for the Buddha and his teachings by actualizing them in our own place and time, our own bodies and minds. Bowing before a teacher, an image, a sacred space, or a fellow practitioner, are inseparable acts of Buddhist practice. But what does it mean to bow? And is it the same as bowing to an adversary? A mountain? A meal? In this dharma encounter, Zuisei Sensei asks Ango participants to step forward and present their understanding or their questions about bowing. As you’ll hear, many of the exchanges are illuminating and might even challenge your own notions about faith, identification, and gratitude.